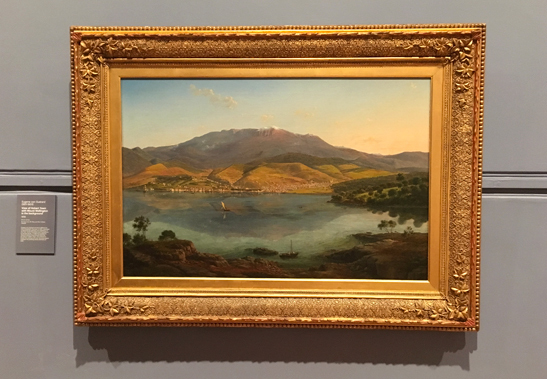 One of Australia’s most important historical paintings, View of Hobart Town with Mount Wellington in the background (1856) is now on show at the Tasmanian Museum and Art Gallery (TMAG). The painting is by Eugene von Guerard who is recognised as one of the greatest colonial artists. The public display of this significant work has been made possible through the generosity of the painting’s current owners, Elias and Colleen Jreissati of Bensons Property Group who have agreed to loan the work to TMAG for at least 12 months. TMAG holds an internationally important collection of colonial art but no works by Eugene von Guerard. View of Hobart Town is one of only a small number of paintings of Tasmania known to exist by the artist and it holds incredible geographical, historical, and cultural significance to this state. The work is now on display alongside similar vistas by colonial artists from the TMAG collection including works by John Glover, Knut Bull, Henry Gritten, Haughton Forrest, and William Duke. With the exception of the Glover, all the works were created within one year of each other and the comparative views will create a rich tapestry of perspectives of the developing town, also reflecting the diverse group of artists who both lived in and visited Hobart. Mr and Mrs Jreissati have owned the work since 2016. They decided to loan the work to TMAG as they felt it was important for Tasmanian audiences to have access to such an important part of our history. “Colleen and I have deep friendships in Hobart and have much love and respect for Tasmania and its people. It was only natural for us to share this wonderful treasure with the people that inspired the artist to create such a masterpiece so many years ago,” Mr Jreissati said. TMAG Director Janet Carding would like to encourage Tasmanians and visitors alike to take advantage of the opportunity to view this work whilst it is at TMAG. “We are extremely grateful to the generosity of Mr and Mrs Jreissati for lending us this important work that will enhance the experience for all visitors to TMAG seeking to learn more about our colonial past,” Ms Carding said. View of Hobart Town is on display in TMAG’s Dispossessions and Possessions colonial art gallery until November 2018. Image details: Eugene Von Guerard (1811-1901), View of Hobart Town with Mount Wellington in the background (1856), oil on canvas, on loan from Mr Elias and Mrs Colleen Jreissati.